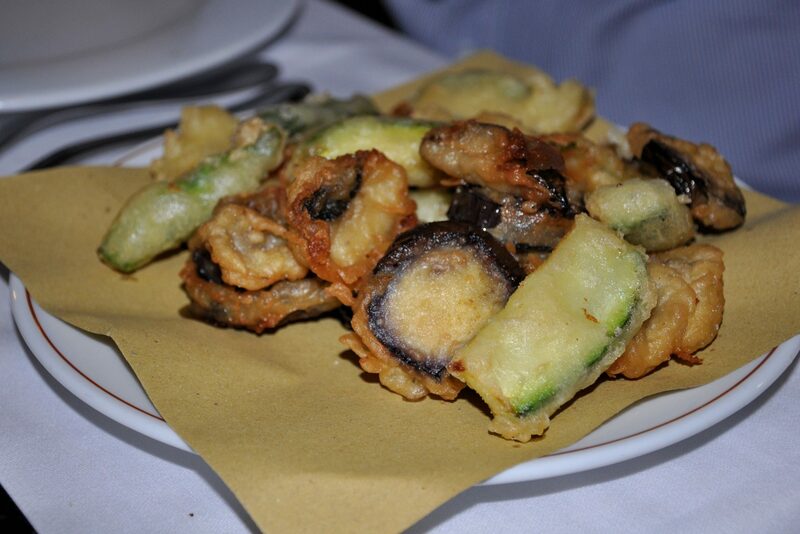 Sometimes, I feel like I'm slagging off on Rome's restaurants more than anything else. However. There is fantastic food in this city, and honest people serving it. You just have to know where to go. When I need a no-fail, top-notch, not-too-expensive Italian meal (like when guests are in town), these are the three restaurants I now turn to. The food is fantastic, the service good, the atmosphere untouristy, the prices moderate. And I haven't found something surprising added to my bill. (Yet). I was a little late to the Flavio al Velavevodetto lovefest, having been preceded by, among others, Slow Food founder Carlo Petrini. But I'm so glad I arrived. Tucked into Monte Testaccio (if you don't believe that the hill comes from an enormous pile of Roman amphorae, thanks to being a dump in ancient times, just check out the restaurant's glass wall, above), Flavio al Velavevodetto serves up all the traditional Roman dishes, but in a way that makes even your 100th amatriciana taste almost, well, new. Don't miss their fritti, vegetables so lightly fried they remind me of tempura. The other bonus of Flavio is the ambience. It's elegant and understated, and the interior is much roomier than at crammed little trattorie in the center. In the summer, you can dine out at the lovely terrace upstairs, a particularly good bet if your crowd is on the loud side. 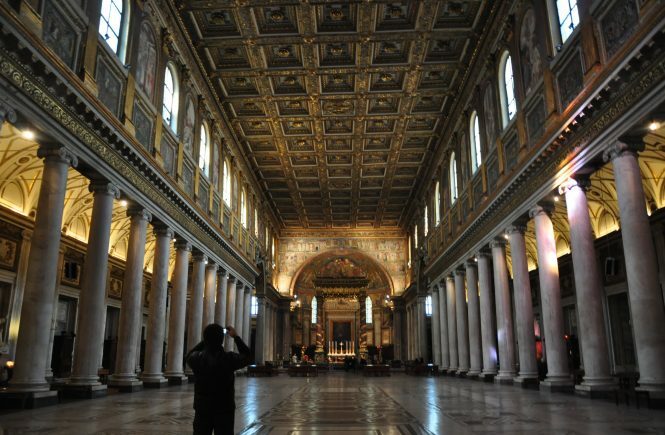 Plus, the serving staff is unfailingly polite and pretty fast—rare things for Rome. 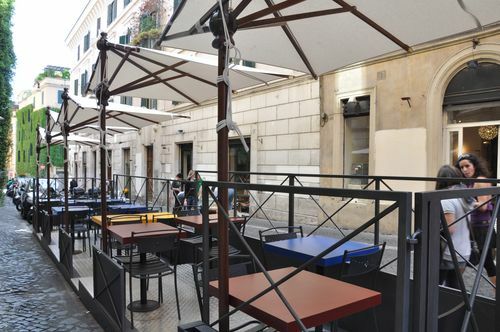 Flavio al Velavevodetto is located at Via Monte Testaccio 97, a short walk from the Piramide metro stop. Or you can, of course, take the ever-present number 3 "foodie" bus to get there. Call +39 06 5744194 for reservations. I first stumbled into Da Danilo because it was just around the corner from my first apartment. Until the newspaper articles on the walls tipped me off, I had no idea that the place was a local legend. Even now, two years later, it remains legendarily good. And surprisingly local. If a bit on the expensive (and, at night, crammed-together-tables) side. The small, so-intimate-you're-bound-to-knock-knees trattoria serves up Roman dishes, but with such fresh ingredients, they hardly compare. 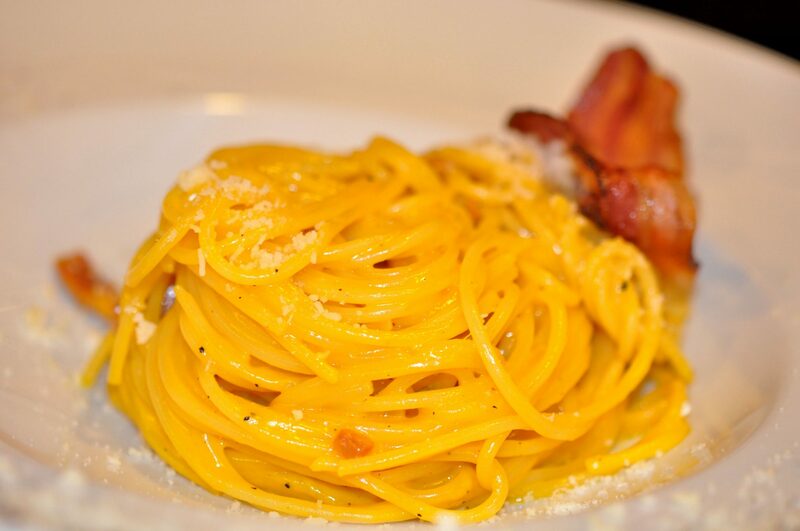 Don't miss the carbonara (top of post), with one of the most delicious, smoky-crispy-perfect pieces of guanciale I've ever encountered. 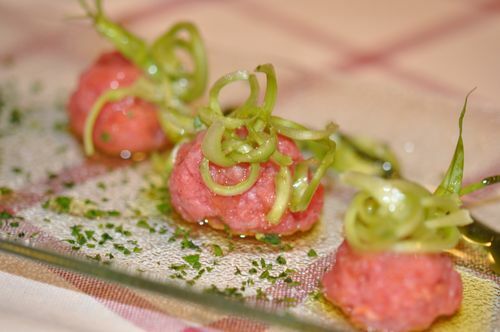 Not to mention this carpaccio, dressed with puntarelle or truffle shavings. Da Danilo is located at Via Petrarca 3, a stone's throw from Piazza Vittorio Emanuele and its metro stop. Call +39 06 77200111 for reservations. I've said it before, and I'll say it again: L'Asino d'Oro just might be my favorite restaurant in Rome. At least, it's in the top three. 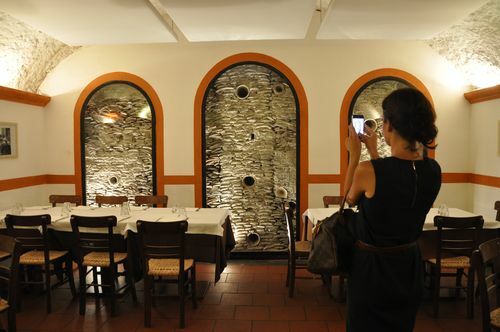 Here's where to go when the idea of more cucina romana, or of checkered tablecloths, makes you want to get on the next plane to anywhere. Yes, the food is Italian—but it's Umbrian. With a twist. No amatriciana on the menu here; instead, look for deliciousness like stewed wild boar in a sweet wine sauce.The atmosphere is sleek and modern, the staff professional, and the prices good. If you're pinching your pennies, you also can't beat the 3-course €12 tasting menu at lunch. L'Asino d'Oro is located at Via del Boschetto 73 in the heart of Monti, a short walk from the Forum or Colosseum. Call +39 06 48913832 for reservations. You’ve got me thinking because the 3 restaurants I fall back on when guests are in town are completely different. Most of them are hole-in-the-walls but that’s what I love best 🙂 I may do a write up on this with reference to this post. Ciao Amanda. 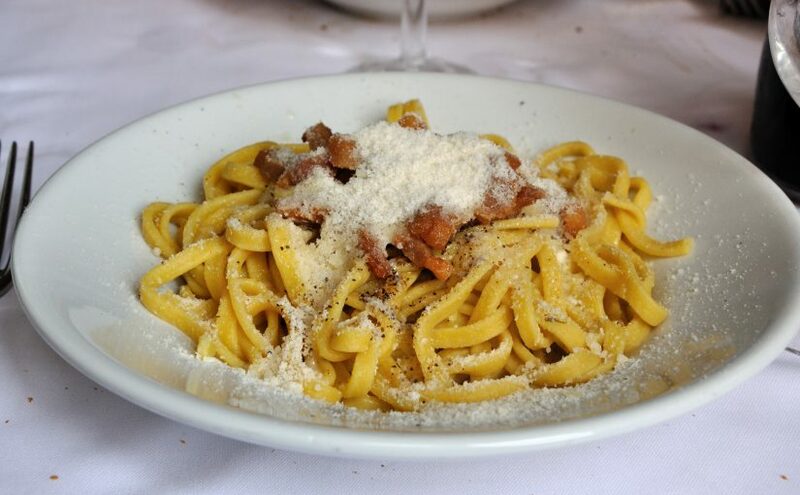 My wife and I sincerely trust in your recommendations as well as just a couple other Rome foodie bloggers. We thought Flavio al Velavevodetto was a great quality meal for the price and went about once a month for the authentic cucina romana, but the last few times they have declined significantly and our most recent was a complete fail. Just wanted to give you a heads up that your recommendation is no longer a no fail and may need reviewing. I wrote about the experience on my blog today. Ciao! Thank you so much for the heads up! For what it’s worth, I ate there a couple of weeks ago (cacio e pepe) and the food was still very good, although the service left something to be desired. However, it’s the first time I’d eaten at Flavio in a few months, and I’ve heard from one or two others that their experiences haven’t been fantastic, either. I’ll be sure to check out the other restaurants when I’m back in Rome. Hopefully next year! Wheb have you been in l’asino d’oro last time? Over cooked meet and boring wines fromBag in Box. Not recommended. Hey Max, I was last at L’Asino d’Oro for lunch a few months ago – it was good, but not as good as it used to be. The post you’re commenting on is six years old, though, and as I’ve written before here, Rome’s restaurants have a frustrating tendency to go downhill once they’ve been “discovered”. I’d recommend checking out my more recent recommendations (like these) for more up to date suggestions. I hope that helps!